I started ‘brain training’ with Lumosity last fall and usually play five games a day whenever possible. If you aren’t familiar with Lumosity, they provide cognitive training exercises that teach neuroplasticity, that is training the brain to use new pathways to complete a task. Cognitive training has blossomed in the past few years and since some of my neural pathways are deteriorating, I thought Lumosity would be an interesting test and might help me build those new paths. The Lumosity training works to improve five areas – memory, flexibility, problem solving, attention and speed – all improvements I can use! After every five game session you get an overall score called the Lumosity Performance Index or LPI which is an average of the five areas and hopefully goes up each day (I wish). But enough of the background, if you want more info, check out their website. I have found that playing the brain games with PD can be a challenge, particularly the flexibility and speed games that usually require the use of the arrow keys on my laptop to select the right answer. I have noticed that I can visualize the correct move but making my fingers press the right key is another thing altogether. As I learned from the presentation by Kaitlyn Roland at the Kripalu session, one of the problems with a lack of dopamine is the brain sends the correct command but it gets scrambled and doesn’t follow the correct pathway which results in the wrong action being taken which can result in a fall, freezing in place or, it appears, pressing the wrong key. The big Parkinson’s news of the last couple of weeks is the publication of a study that cinnamon might stop the progression of Parkinson’s Disease! I figure this means I should be baking and consuming my famous (in some circles) Gram’s Pecan Rolls so named because the recipe is from my daughter in law Monica’s Gram and it is full of cinnamon. Of course the study was conducted on mice so I don’t know how many rolls I need to eat daily but do know what the effect would be on my weight! Guess I’ll wait for more information before getting the baking equipment out but I wonder if my LPI would go up? Sounds like a clinical study in the making! We had a great 4th of July visit with son Ryan and his wife Sarah and their son Julian and his half brother Trysten. In addition, grandson Jake and granddaughter McKenna and her friend Katie also joined us for the holiday weekend so we had a houseful. The kids enjoyed tubing on the lake and swimming off the dock, and we all enjoyed taking the boat down to watch the fireworks go off over the lake. 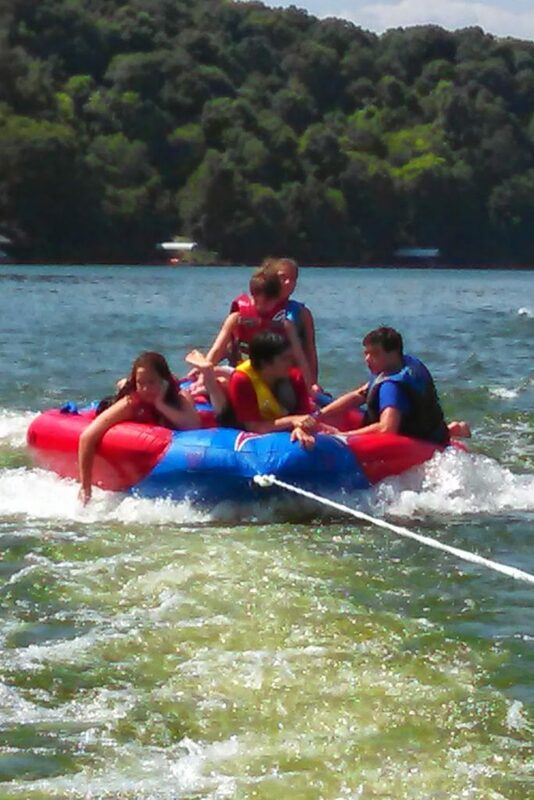 We even managed to load the tube with all five kids for some fun on the lake. Again some fishing and paddle boarding took place along with watching the World Cup games. Next week it will be one year since my PD diagnosis and a lot has happened in the space of the year, most of which I have managed to chronicle in this blog. Once again I thank you all for sticking with me on this journey, your support means a lot to me. BTW, if you are a tweeter, follow me on twitter by clicking on the link on the right below my profile.